Each year parents struggle with the same question...what should I put in the Easter basket. That bunny needs to be cute, clever and (hopefully) wallet friendly. Hide 'em and Hatch 'em Eggs! These pastel colored eggs are great for hiding or filling the Easter basket...but here's the twist: simply soak them in water overnight and out will hatch some new friends...a duck, chick or bunny! These are so cute and something different than the normal candy we pack in plastic eggs each year. Kids will be amazed and parents will delight in the fact that there's no candy involved. 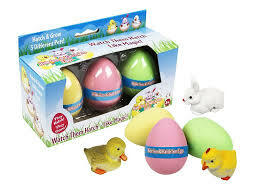 Hatch 'ems are currently the #1 Easter product on Amazon.com and everyone is going to want them! **Disclosure: Product sample was provided to facilitate this feature. No compensation was received.